Gorgeous looking in my new Renovated kitchen. The sink is wonderful. More details you ask? Quality of stainless, flawless. Deadening, superb. Seams/edges, smooth and flawless also. Accessories (drain hardware and draining grates) are in the same group as above..1st rate. One thing that is not listed in any of these Kraus sinks, is that the sink CAN BE INSTALLED ABOVE the counter top as well as below. For those of you who do not have a solid surface counter these sinks can still be utilized in your kitchen. We just attached ledgers (boards) to the left and right inside of the cabinet, and the exterior side lip of the sink rests on them. You can adjust the height of the sink above the counter to your preference. Looks great.. This sink will add class to any decorative style in your kitchen, whether it be "country" or contemporary. We love it, and recommend this sink to others without hesitation. 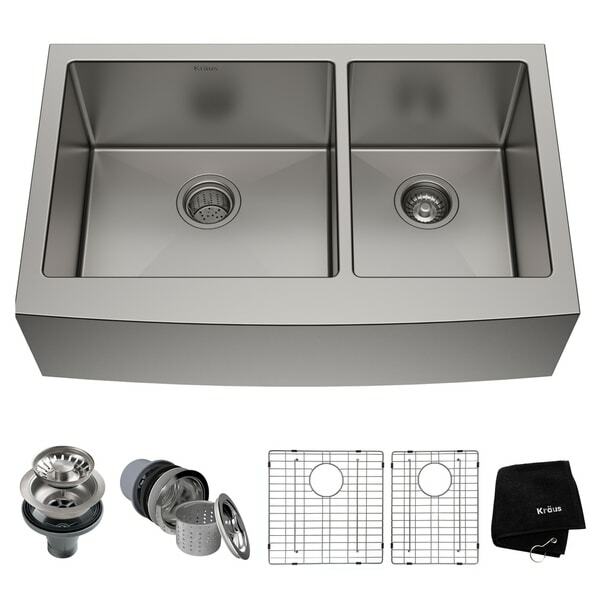 If you like the looks of this sink from the pictures of it online you will not be disappointed when it arrives. I work in the kitchen remodeling field so I have seen many sinks. This one was packaged better than any I have seen and as a result arrived with no damage. The drain racks that protect the bottom of the sink seem like they will be a useful feature. One thing that was a surprise to us was that it comes with two styles of drains, both are higher quality than you would get at a big box store. One has an extra deep basket with a handle that makes it easy to pull out to empty. It could fill up with nearly 2" of food debris and still drain properly because of the design. We plan on installing a disposal but I think this would be a must-have feature if you don't or can't install a disposal. All I can say is if you are thinking of buying this sink and your only question is whether or not you will be happy with its quality, please click the "add to cart" button now. I installed this sink with the “Kraus Commercial Pre-rinse Chrome Kitchen Faucet” (Item#: 11345091) and I must say they look, work, and feel AWESOME! I installed the sink ½” ABOVE the counter top and it is amazing. The sides showing slightly above the counter, with the front exposed, makes this sink flow with the counter. The installation was custom, as I built my cabinets, but a good two by four cupboard skinned with ¾” poplar did the trick nicely. The integrated strainer basket, and bottom racks are a great feature. I would recommend this product, although installation may need a professional, depending on your carpentry and plumbing experience. Drawbacks: There is no plumbing from one side to the other provided, though it’s cost is VERY low ($$ at Lowes). The sink is deep so ensure you have the room for a disposal if you intend to use one. The web site pictures don't do this sink justice - it is beautiful. Every part of the sink and it's accessories speaks to Quality. The 10-inch depth of the bowls is going to be a big badvantage over the 5" depth in the bowls of our current sink., one of the reasons we selected this particular sink. It was expensive, compared to other stainless steel sinks, but worth every dollar. The "farmhouse" style front apron will complement our other appliances, especially the Electrolux gas cooktop, which has a stainless steel apron for its control knobs. I absolutely love this sink. It is a farmhouse apron style, and it is mounted under the counter. The front of the sink protrudes slightly from the cabinet, and it is gorgeous. It's easy to keep clean and to avoid scratches to the sink bottom using the stainless metal grates that sit on the bottom of each side of the sink. I pop the grates in the dishwasher when needed. Also, my sponges never sit in a puddle of water (a pet peeve). Unbelieveable value for the price. The sink I first ordered I returned due to dents. Overstock customer service was the best. They promply returned the sink and gave me a new one within a few days. My family and I could not be happer with this Kraus bow front ss sink. The sink came with the strainer and sink protective grates. The installer was impressed with the quality and details of the kitchen sink. I also got a Kraus faucet which fit very well with this sink. Thank you Overstock! This sink is the one to buy! The sink is beautiful, ghigh quality and unique. The design is attractive and the attention to quality is noticeable. I would recommend this sink to anyone looking for a stainless farm sink. The wire racks included in the package were pretty cheap, however. I kind of expected this whenI ordered it, so it did not take away from my satisfaction with this company. Bottomline: If you are buying this sink for a unique, beautiful addition to make your kitchen stand out and last for years, then do it. If you are buying this sink because you lost your wire drying racks and this is the best deal you can find, keep looking. So, I love the look of this sink. It's absolutely gorgeous and a true showstopper. When people see our new kitchen, they immediately love the sink. The fact that it's farmhouse but stainless steel gives it a nice modern feel. The reason it didn't get five stars is that the bottom is a bit too flat and the water doesn't always drain as well as I'd like, allowing "crud" to build up in the square corners. It's easily washed away, but kind of yucky sometimes. Put this in my new kitchen - it's huge, deep, sturdy, insulated, and beautiful. Been using it for about a year now and it's just as nice as the day we got it. I got this sink on black friday for an upcoming kitchen remodel. And while I don't have it installed yet I can tell you it's a tank of a sink. Heavy duty, well constructed, nice looking. The first one I ordered was damaged in shipping (I think the shipping company must have dropped it from about 10' to put that dent in it) and I had no problem getting a replacement from Overstock.com either. This Farmhouse sink is a perfect fit in my kitchen. I was very happy with the quality of material and the overall look of the sink when it was delivered. I am very happy with this purchase and recommend this product if you are looking at buying a farmhouse sink. I am a homebuilder and have purchased over 30 stainless farmhouse sinks from Overstocked.com. This Kraus sink is fabulous. They are shipped very well packed in thick formed Styrofoam. They are never damaged when received. They arrive within 3-5 days. They are considerably less expensive than local plumbing stores and you don't even have to leave home to receive it. Love the grate in the bottom of the sink! Very heavy and sturdy, even my contractor wanted to know where I got it, he was so impressed. Looks great in my new kitchen with my new stainless steel appliances. Absolutely love this sink!! It is everything we were looking for and more. The sink is very durable, cleans easily and is very deep which is great for cleaning dishes. Bought this for my daughter’s house. Paid a hundred less than something comparable at big box store. Great product. I love everything about this sink except one thing: The divider between the sinks would be better if the top would be beveled. As it is, every time water drips on it, it stays there, spoiling the look. Still, on the whole, I love the sink. It cleans well, it is large, it looks great. I love this sink with the 2 individual bins like a regular sink,but larger. 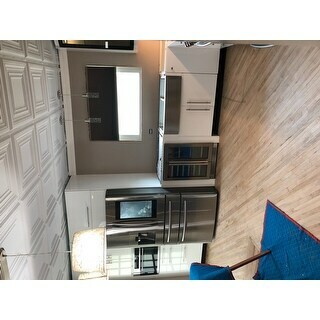 It looks great in my new kitchen and matches all my other appliances I would recommend this to anyone that is remodeling their kitchen!! "I would like to do this as a Top mount sink. Is the measurements given of: The overall Size is 32 7/8" W x 20 3/4" D x 10" H. total? Or is the Dept measurement of 20 3/4" how much counter space it takes up? I would like to mount a commercial looking faucet but wondering if there is room for it. Also is there pre-holes stamped on the sink for top mounting the sink?" We did an undermount, we were remodeling so we had to move the sink forward to have enough room to installed our commercial faucet, we were doing new cabinets so we had to get shorter cabinet as the sink was very deep. If you are remodeling you have to get a Plumber as the pipes can be tricky. Not sure if there were holes in the sink, will respond to that later. It is beautiful, love it so much. I get compliments from anyone who comes through the door. The price is the best out there. We had to do an undermount and the faucet is mounted through the counter. I don't think this can be top mounted. It did not have pre-drilled holes for a faucet. "Hello can you guys find the kindness in you to send me a sales team email address please?" "what is the minimum size cabinet needed for this size sink?" " Hello – I'm not understanding your measurements obviously – the apron front, how many inches it from top to bottom.? I have limited room before the top of cabinets underneath start thank you "
"Does this sink have one side for a garbage disposal? I can't tell in the picture." Yes, I have a disposal on the right side, and believe it can go on either side. "Does this Kraus 33 inch farmhouse SS sink match the Kraus Mateo SS faucets in color?" "Can a garbage disposal be installed with this sink? If yes, does it need to be a specific kind? Any recommendations "
Our plumber installed a garbage disposal in our sink. You are welcome to install a garbage disposal on this sink. We recommend consulting your plumber to have this done.